"Negative, Responsive and Other Competitive Doubles" by Harry Feldheim is a 1993 revised edition of the Feldheim classic. The book has been expanded to include many of the newer expert methods and includes lots of puzzles and examples. "Negative and Responsive Doubles in Bridge" by Harry Feldheim is a pamphlet that briefly describes these two topics. "Dear Billy" by Billy Muller was created in 1987 as an an intermediate level question and answer column the ACBL bulletin and continues as a monthly feature in the Western Conference Bridge Forum. This book is a collection of enlightening and entertaining new material, as well as some of the most popular, previously published columns. "Natural Therapy for Defense Disorders" by Lajos Linczmayer is a complete and coherent defensive system for intermediate to expert players. It show your partnership the signaling methods to use no matter what situation you face. Standard and upside-down signals are covered in detail with hundreds of examples. "Blackwood on Bidding: Dynamic Point Count" by Easley Blackwood. This is the book for simple easy hand evaluation at bridge. There are dozens of systems that may be more accurate IF you have a computer and unlimited time to do computatiosn. But this is the one for real people to use in a real game. Voids never won a trick! Tricks are won by high cards, trumps, and long cards and these are helped by timing and position of the cards. Controls Fit and grouping/placement help which mirror distribution and wasted excess high cards detract. With millions of possible hands no simple method can do more than provide a good approximation for the patterns not every detail. This books dynamically measures the strength of a bridge hand by a combination of the high cards, trump length and other suit length while making adjustments as the bidding shows that strength/length lies to the left/right of the bidder. "Blackwood on Slams" by Easley Blackwood is an extensive treatment of the problems with slam bidding and playing. Topics covered include. How to assess your partner's holdings. How to bid your slam hand. How to decide between the small and grand slam contract. How to stay out of intriguing contracts that won't make. How to play the marginal slam hand. How to defeat your opponent's slam contracts. One of the worst misfortunes that can befall a declarer is to lose control of trumps in the middle of a hand. Nothing is more embarassing than running out of trumps and having to watch helplessly as the defenders cash winners in their long suit. With Hugh Kelsey's "Test Your Trump Control" you can test your skill in a quiz that covers all aspects of trump control and becomes progressively more difficult. "Improve Your Bridge - Fast" by Alan Sontag and Peter Steinberg is specially designed for the vast majority of bridge players who want a quick and enjoyable way to improve their game. Alan Sontag is regarded as one of the best bridge players in the world. He joined the World Champion "Dallas Aces" to compete for National and International Championships and he co-authored a syndicated bridge column (with Oswald Jacoby) that appeared six times per week in over 500 deaily newspapers. Peter Steinberg currently teaches bridge at the prestigious Beverly Bridge Club in midtown Manhattan. The Bidding Precisely series of four books by Katherine Wei and Ron Anderson is aimed at the intermediate - advanced player. The first two books of the series apply to the Precision Club System but the latter two are applicable to all systems. "Bidding Precisely vol 1" by C.C. Wei and Ron Andersen tells you all you need to know about the basics of the Precision Club System. 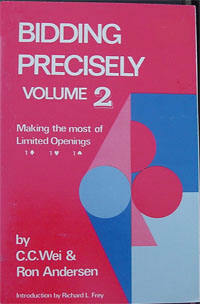 "Bidding Precisely vol 2 - Making the Most of Limited Openings" by C.C. Wei and Ron Andersen covers the bidding sequences after a 1 club, 1 diamond or 1 heart opening when playing a strong club system. "Bidding Precisely vol 3 - Profits from Pre-empts: " by C.C. Wei and Ron Andersen is a comprehensive volume on a neglected area in bridge - the preemptive bid. Sound advice on weak twos, 3-level openings, high preempts and handling your opponents' openings. "Wouldn't you like to preempt your opponents out of their best contracts and, at the same time, avoid having your shutout bids working against your own partnership? That's what this book shows you how to do no matter what system you play." "Bidding Precisely vol 4 - Perfect Your No Trump Bidding" by C.C. Wei and Ron Andersen is certainly about bidding precisely. In this it fully lives up to the title of the series. But it is not just about precision or any other system; every notrump, weak, strong and intermediate, is examined. And so is virtually every gadget, treatment, and convention, and all variations to which each, in turn, gives rise, in defense as in attack. Every pro and con is examined, every range narrowly pinpointed. "Play it Again Sam" by Terence Reese and Martin Hoffman is an interesting collection of hands that Reese has played or defended and explains how the non-expert and the expert played them. The style of the book is unusual, first you see how a good player in the South position has managed the play, and on the following page his partner, a somewhat abrasive character, explains how the play might have been improved. "The Polish Club" by Greg Matula. In 1963, a series of articles appeared in the Polish bridge magazine Brydz with the outline of a national bidding system, based on a nebulous 1 club opening - the Polish Club. The readers loved the idea, and the articles continued for another three years. Since then, many new ideas have been added - and Polish Club is today a mature and efficient system, well tested in international competition. Still, it has never before been presented to non-Polish readers. Greg Matula, of Warsaw, is one of Poland's leading players and writers. He has made a detailed description of the modern version of Polish Club, one of the best bidding systems today. 1- oriented to distribution, which gives priority to showing suits over showing strenth; exampels are ACOL or Standard American. 2- oriented to strength, which prefer to estimate the total strength as soon as possible: an example is the Precision Club system. In "A Modern Version of the Polish Club - WJ05", Krzysztof Jassem describes the Polish Club system that takes the best of both; you very soon find your fit and can estimate the total strength at the same time. Edgar Kaplan was the publisher and editor of The Bridge World for more than 30 years. "Bridge Master: The Best of Edgar Kaplan" celebrates his many significant contributions to the game and its literature: the revolution in table behavior, the switch to truth and completeness in tournament reporting, the principles that underlie the Kaplan-Sheinwold system, winning at-the-table philosophies, witty observations on the game and the people who play it. The articles and stories are intertwined with lots of great deals - some that he played, some that he reported, some that he constructed. "A Bridge Too Far?" 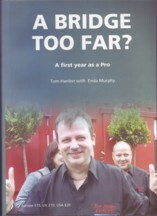 by Edna Murphy chronicles the first year of Tom Hanlon's new life as a Bridge Pro. Not knowing if he will succeed in it, nor for how long he'll want to stay at it. For now, he's living the dream, and trying to keep personal and professional considerations, including supplementing his income by playing poker, in some sort of balance. "Master Play in Contract Bridge" by Terence Reese teaches you how to win those few crucial tricks with masterful play. 130 deals, drawn from years of tournament and championship competition, reveal superb strategies and technique: the deep finesse, loser-on-loser variations, holding moves, waiting moves, a whole galaxy of fascinating stratagems.